by Alec Clayton – Visual Liberties is the final book in the Freedom Trilogy, the saga of the little Bayou town of Freedom, Mississippi. The trilogy started with The Backside of Nowhere and was followed by Return to Freedom. In this final book, Molly Ashton is now a college student majoring in art. She is trying hard to grow up, find her way in the world, but it seems she does nothing but make bad choices … until she makes friends with Francis Gossing. Francis is Molly’s only friend in college. He is socially awkward but an artistic genius, and he is haunted by a frightening vision of his mother and a man with a gun. He can’t tell if the vision he’s obsessed with is a memory or a nightmare from long ago. Struggling to find their way in the world, Molly and Francis find an unexpected ally in the person of Travis Earl Warner, the once famous artist known as Red Warner who has abandoned the world of art to live a hermit’s life at a fishing camp on the Mary Walker Bayou. Molly’s parents, Malcolm and Bitsey, rebuild thier tattered marriage, Sonny Staples returns to Freedom after a time in the state mental hospital, and a stranger who looks like the late Weatherman Donny comes to town. “When I was a kid, I used to look up at the old story-tellers on the porch and wish I was wise enough and entertaining enough to join their company. Alec Clayton has long since joined the old story-tellers on the porch. All this, and more Red Warner too!” – Jack Butler, author of Jujitsu for Christ and Living in Little Rock with Miss Little Rock. “It’s a great conclusion to Alec Clayton’s Freedom Trilogy. There are artists, lusty art students, horny professors, ordinary people in extraordinary situations, resonant passions. What’s not to like?” – Larry Johnson, author or Veins. 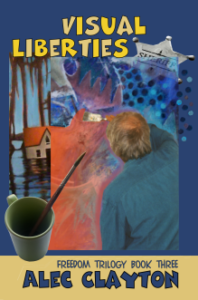 Order Visual Liberties from your favorite bookstore or Amazon.com or CreateSpace.